The end of Donald Trump’s US government shutdown provided little assistance for the US Dollar last week. rump finally caved to growing pressure, as the consequences of the historic 35-day shutdown started to spill over into airport chaos. He announced a deal that will reopen the government at least until 15th February. Somewhat paradoxically, the US Dollar fell sharply as investors fled safe-havens and instead favoured risk currencies. Over in Frankfurt, Mario Draghi delivered another dovish assessment of the Euro-area economy following the latest ECB meeting, further pushing back expectations for the timing of what will be the bank’s first interest rate hike since 2011. 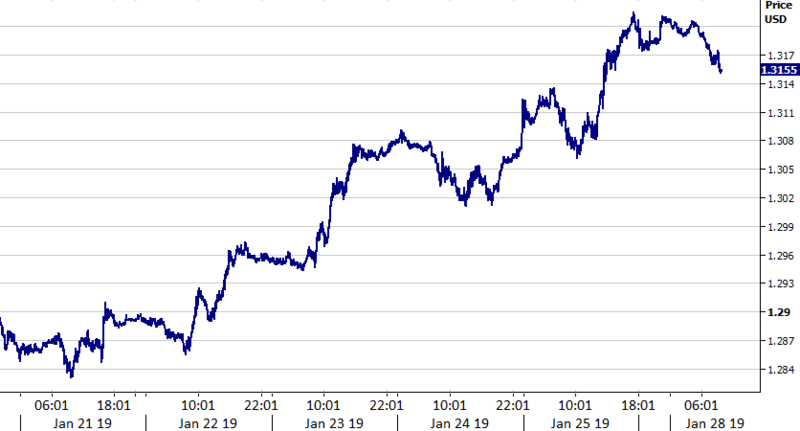 Meanwhile, the Pound smashed back through the 1.32 mark versus the USD on hopes that Britain would avoid a hard, ‘no deal’ Brexit. Attention this week will now turn to Tuesday’s parliamentary vote on Theresa May’s ‘plan B’ for Brexit, Wednesday's FOMC meeting and Friday’s US payrolls report. Sterling put in another very impressive performance last week, rallying by over two percent on growing optimism that a ‘no deal’ Brexit will be avoided (Figure 1). Support among MPs for Yvette Cooper’s amendment that would delay Article 50 sent the Pound sharply higher, as did reports that the DUP could be ready to back May’s deal, provided a time limit to the NI ‘backstop’ is included. This week will again be dominated by Brexit, namely Tuesday’s parliamentary vote. The vote will not be on May’s deal itself, but on the proposed amendments to her withdrawal bill. We think that strong support among MPs for either a delayed Brexit, second referendum or ruling out of a ‘no deal’ would see a sharp rally in Sterling. The Euro briefly touched its weakest position against the US Dollar since mid-December last Thursday, driven lower by a dovish ECB and signs of a further drop off in economic data. The critical composite PMI, the leading indicator of activity in the bloc, slowed to just 50.7 in January, its lowest level in 66 months. ECB President Mario Draghi then stated following Thursday’s monetary policy meeting that incoming data was ‘weaker-than-expected’. Crucially, he also tweaked the rhetoric in his statement regarding the balance of risks to growth from ‘moving to the downside’ to ‘moved to the downside’. The cautious tone of last week's ECB communications reinforces our view that the first interest rate hike in the bloc since 2011 still remains a long way off. We think that we would need to see a significant turnaround in both PMI and core inflation data to keep hopes of a 2019 hike alive. The greenback fell across the board following Trump’s announcement on Friday. This was, in large part, due to a return in appetite for risk and investors fearing that the slew of economic data, whose publication has been delayed by the Federal government shutdown, could show that the US economy slowed at the end of last year. The next few days will be important for the US Dollar, in particular, Wednesday’s Federal Reserve meeting and Friday’s nonfarm payrolls report. We expect the Fed to keep policy unchanged, with no meaningful change in the accompanying rhetoric. Friday’s payrolls report, one of the few major economic data releases not delayed by the shutdown, is expected to show steady wage growth above 3% and solid job creation around the 170k mark.